Oreo Fudge Cremes are a thin, fudge covered cookie with an Oreo creme twist, available in Original, Mint, Peanut Butter Creme and Golden. The product line is being promoted in a television commercial, “Indescribably Good”, aimed at the whole family. 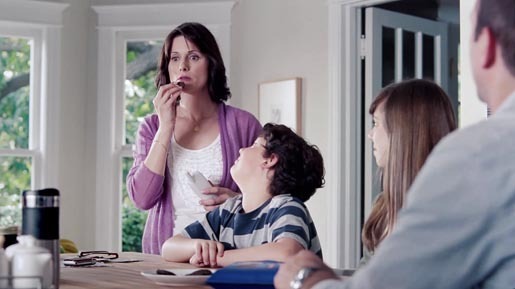 As each member of the family tries the new Oreo, words fail them. The Oreo Fudge campaign was developed at DraftFCB, New York, by chief creative officer Darren Moran, group creative director/copywriter Gary Resch, creative director/art director Noah Davis, group creative director/copywriter Jill Applebaum, producer Jennifer Glendining, head of broadcast production Paddy Giordanom, group management director Susan Polachek, account supervisor Pinsuda Sagooleim. Filming was shot by director Harry Cocciolo via BOB Industries, executive producer John O’Grady, director of photography Tim Hudson, and production designer Joaquin Grey. Editor was Jim Ulbrich at Beast Editorial with executive producer Elizabeth Krawjeski. Visual effects were produced at Public Art.